The climate of Miyako-jima is sub-tropical, with very mild winters, and long, moist and rainy summers. 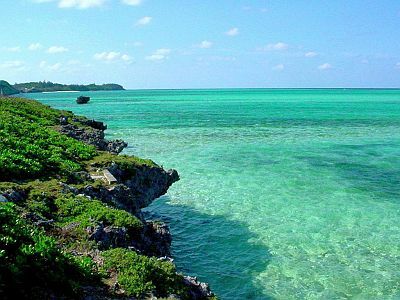 Miyako-jima is the most important island of the archipelago of the same name (Miyako Islands), which is located to the east of Taiwan, and administratively is part of the Okinawa prefecture. Other islands of the Miyako archipelago are Irabu, Minna, Tarama, Kurima, Ikema, Ogami, Shimoji. 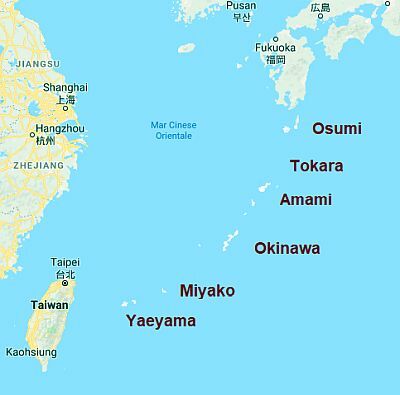 Together with the Yaeyama Islands (see Ishigaki), the Miyako Islands are part of the Sakishima Islands, in their turn belonging to the southern Ryukyus. The latitude of these islands is very low: a bit to the north of the Tropic of Cancer. Near the islands is a coral reef. Although the winter is very mild, the sky is often cloudy, and periods of bad weather, with wind and rain, are quite common. Every now and then, especially in January, there can be very cool days, with highs around 16 °C (61 °F) or less and lows around 10 °C (50 °F) or less. The long summer is muggy, with fairly frequent, and sometimes abundant rains. The first part of the rainy season, called the plum rains (Baiu), begins one month earlier than on the main islands of Japan, so it occurs in May and June, however, between one shower and another the sun can come out, especially in June. In July, there is a relative pause, so the rains decrease and sunshine becomes pretty frequent. In fact, from June to October, with a peak from August to early October, Miyako can be affected by typhoons, the tropical cyclones of Southeast Asia, which can bring strong winds and torrential rains. The sea in Miyako is never cold, in fact the water temperature reaches a minimum of 23 °C (73 °F) in January and February, so if you want you can try to swim even in winter, while it gets very warm in summer.